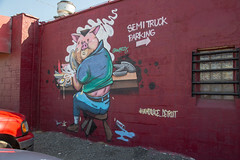 A good discussion of Detroit’s culinary history has to include not only the Coney Island and the unique square pizza, but it’s also got to talk about ham. You see, back in the mid-20th century, much of Detroit’s burgeoning workforce needed quick, cheap, and nourishing meals to sustain them through their work day. The many “Coney Island” restaurants that are still common throughout the metro area were one answer to that, but in the middle of the 20th century, the many factories of Detroit and Dearborn lead to another style of diner appealing to the blue collar worker: the Ham Palace, and instead of the typical Greek owners of a Coney, a ham palace is generally owned by Eastern Europeans such as Albanians or Poles. The concept is simple: your basic diner, but instead of focusing on Coney dogs, the star of the menu at a ham palace is ham: one of more large ham roasts sitting in the kitchen, with thick slabs cut off the bone to order. It makes for a great centerpiece to both breakfast and lunch menus: a ham platter for breakfast, a ham sandwich for lunch, or a nice pea soup made from the trimmings. Starting in the middle of the 20th century, a good number of factories around the area had ham palaces, ham sandwich stands, or even places that sold entire roasted hams to go (indeed, the famous “Honey Roasted Ham” company started in a modest building, existing but vacant, on Fenkel Road in northern Detroit). At one time Dearborn even had over a dozen such establishments, but as the auto industry and the area’s fortunes waned, these businesses started to wane as well. That said, there’s still a good number of them in existence, like Lile’s Sandwiches in Dearborn on Michigan Ave (in a true nod to multiculturism, it’s actually a ham sandwich shop nestled in among several halal Middle-eastern places now), or Mike’s Famous Ham Place about a mile to the East in Michigan. Or, for this visit, I was looking for one of the places still named as a “Ham Palace”, A&L Ham Palace on Fort Street. 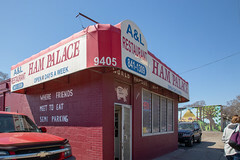 While my Detroit area reviews often talk about areas getting redeveloped or gentrified, A&L Ham Palace definitely isn’t in one of those areas. Located almost perfectly halfway between the Ford Rouge Complex and Zug Island, A&L sits across from Woodmere Cemetery (resting place of many famous Detroit citizens like David Buick, David Whitney, or James Vernor) in a part of Detroit’s often ghost-town like Delray neighborhood. Indeed, this part of Delray is known as the “Carbon Works” district, since for many years this area was home to the Michigan Carbon Works that would render buffalo bones into high-quality carbon for use in carbon filtration and pigmentation (really, I’m not kidding). These days, aside from Fort Street being a modest arterial street paralleling the freeway and hosting the nearby Produce Terminal, it’s a pretty quiet area outside of shift change for the nearby factories. But A&L is actually quite a pleasant little diner, with both a large service counter and a handful of tables grouped along one wall. But really, the star of the show is the grill: like any good diner, A&L feature a large central flat top used to make the various breakfast and lunch dishes to order. 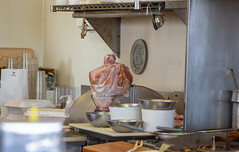 Next to the grill on the left is a giant roasted ham, and as each order comes in the cooks slice large slabs off of it to make sandwiches or slap onto the grill for a quick sear. We arrived in the lull between breakfast and lunch, and while a few of the lunch specials called out to (particularly, the “Double Damn Ham with Ham and Bean Soup”), we decided that breakfast was definitely in order. 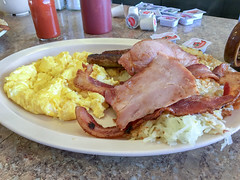 And while the menu had a lot of variation on the “eggs and meat” theme, the central “Breakfast Combo” was definitely the way to go: two eggs, two slices of bacon, two sausage links, two slabs of ham, and hashbrowns. For $7. Ordering two of those with scrambled eggs, along with splitting a short stack of pancakes, a few minutes later we were looking at a veritable mountain of food. 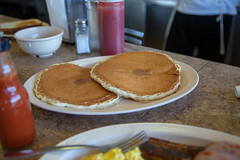 The pancakes were good as well: I’m not always a fan of straight up buttermilk pancakes, but these had a pleasant crisp to them and a nice, firm texture. This rounded out the breakfast quite nicely. Overall, A&L Ham Palace was quite a nice breakfast destination: the cooks are excellent, the staff very friendly, and they keep a pleasant and clean restaurant operating. The breakfast was phenomenal, and I’m sure if I come back at some point for the “Double Damn Ham” I’m not going to be disappointed. A&L is definitely a Detroit gem.